I am a practicing, trans-disciplinary artist living and working in Brooklyn and Mexico City. My work is intended to connect various cultures through the platform of contemporary art by engaging creative practices that promote dignity, shared values, diversity, and collaboration through reciprocal exchange of knowledge. I have initiated projects with the Yanomami of the Venezuela Amazon to document their oral history (ongoing); continue developing collaborative projects with traditional stilt dancing groups from Trinidad and Tobago, Brooklyn and Oaxaca and master artisans from Mexico that combine dance, music, costuming, procession and protest; as well as directed a 10-year effort to repatriate the remains of Julia Pastrana (1834-1860) Mexican Opera Singer whose body was kept at the Schreiner Collection in Oslo and was successfully repatriated to Mexico for her burial in 2013. My work seeks to further the expectations of socially-engaged art by moving across disciplines by involving collaborators across various fields such as archivists, scientists, activists, rock stars, burlesque performers, street dancers, traditional artisans, traditional stilt dancers, theater companies, storytellers, writers, international institutions and government officials. I have worked for over 30 years as an artist, educator and researcher. 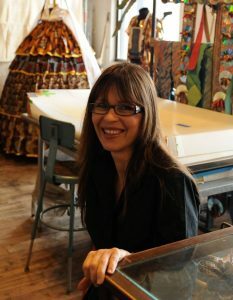 As a CAA Board Member I offer a perspective that is uniquely informed by my bi-cultural background and my extensive collaborative artistic experiences in Mexico, Venezuela, Trinidad and Tobago, Norway and the United States. All of which I believe have prepared me to serve and further CAA´s international leadership and its mission to promote visual arts and their understanding through advocacy, intellectual engagement and a commitment to the diversity of practices and practitioners.